I used to resent neediness - because I thought the Lord did. I knew He wanted me to be needy for Him, but I also thought He called me an idolater when I had a need for people. Admitting I needed people felt like I was telling the Lord that He was insufficient for me, that He alone couldn’t meet all my needs. Christ alone… right? I love truth. I am learning to love how our understanding of truth grows and develops over time and with practice. On some (most) days, I wish I knew everything… wouldn’t life be easier that way? Maybe so, but if I knew everything, life would be starved of connection and relationship, and that’s what we’re all really after - love and connection. I treasure the moments when the Spirit of Truth comes close to teach me something I couldn’t know without His help. These moments are precious because conversation and connection happens as a result of my not knowing (or fill in the blank - my immaturity, my naiveté, my simple humanity - my neediness). If my neediness for the Lord acts as an invitation for Him to come close, where am I to stand with needing people? and ultimately... Can I be close to people without needing them? I have been on a beautiful journey the past few months of learning what the Father is REALLY like. Who is this God I call Father and Friend? (Really, we are all on this journey for the entirety of life, but I have concentrated the past few months for that purpose). God is helping me bridge the gap between what I know I “should” believe about God in my head and what the core of me actually believes in my heart. In this process, He is showing me that He created me to NEED PEOPLE. He created me for family! Within the Trinity but also with humanity. I knew this in theory, but I did not know that my need for others does not keep me from looking at God as my sufficient provider and need meeter. Rather, my neediness for other people expands my view of His sufficiency in my life. If you’re like me, you’re asking, how the heck does that work!? Like I said, I thought God looked down on my need for people. I thought God was shaming me, so I shamed myself. I shamed myself for feeling almost anything that invited others into a messy process instead of a neatly folded resolution - for feeling lonely, for wanting help with a problem from a friend, or for not knowing something about God. Shame told me, “You should have learned this in your quiet time.” “If you spent more time with God maybe then you would know what you’re supposed to do with your future.” “If you can’t solve this one alone with God then something’s wrong with you.” Does this sound familiar? I hope it doesn’t, but this was the internal story I often agreed with. I could do an okay job identifying my needs, but I thought that if I left the secret place without every need of mine met, I was doing it all wrong. Now for those of you who know me, you know I’m about as extroverted as they come! My isolation was very much inward for me - lots of incredible friends but not a lot of these people were invited to help me in my areas of needs. After all, I didn’t have needs. Isn’t that true maturity? Let’s think about Jesus. He grew in Mary’s WOMB for 9 humble months and was born in a stable among animals. King Jesus, the baby. Did He have needs? Certainly, babies are extremely needy. And Jesus' needs continued and shifted as He grew. When we think about Jesus we don’t traditionally describe Him as needy, but could it be that Jesus had needs on this earth as a human - the same needs we have? Did Jesus need help with anything? Do you ever think about that - did the Teacher need to be TAUGHT how to be a carpenter, did the Way need help navigating to the next town? Did Jesus ask for directions? Did He ask His mom for advice? Did He need to spend lighthearted time with His friends? and Can Jesus relate to (and even celebrate) our neediness? Matthew 26 shares a story of Jesus’ neediness that has flipped my world upside down. Jesus was in the Garden of Gethsemane shortly before He was crucified to pray to the Father. He asked His friends to be there to pray for Him and keep Him company in His place of utter need and weakness. He invited others into one of the darkest times of His humanity; He asked for help. Jesus has grace and understanding for weakness because He lived in weakness Himself. Glorious weakness. God never shamed me once for my weakness or my needs, I was living with an incorrect view of the Father. There is absolutely zero shame or condemnation inside of Him; He is love. As I learn of Jesus' weakness and neediness, I am growing comfortable with my own. I thought I was living in fullness, but rejecting family is not fullness, because it violates a Kingdom principle. I had NO IDEA that God wanted to meet my needs through other people. Or even that some of my needs could only be met by other people?! That is wild!!! 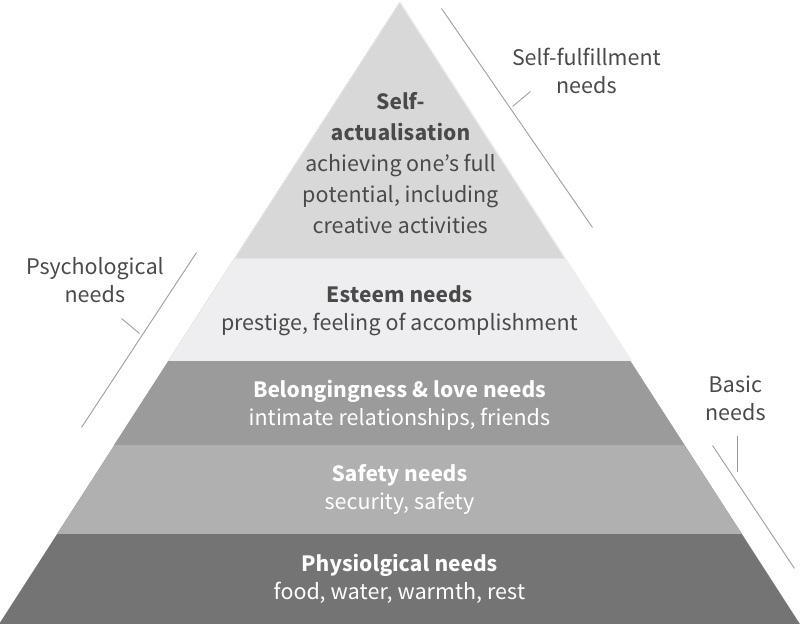 Psychologist Abraham Maslow studied human need. We've probably all seen this chart, but it's a beautiful reminder that some of our core human needs for community and family (shared experiences, laughter, listening, being helped, healthy communication, feeling loved, etc.) were designed by God to be met by humanity. He is full of wisdom and He does nothing apart from LOVE! That is amazing!! While we do find intimacy alone with God, we cannot live a sustainable life alone in our prayer closet. We need human beings. I didn’t know that until a few months ago! I have found compassion for myself as God reminds me that He never expected me to know everything, anyway. He is the Spirit of Truth, the Good Shepherd, the Teacher of all teachers and He is faithful to come teach us what we need to know in His timing. AND, when He comes and teaches, He gives us grace to PRACTICE! What a relief! So... I have been PRACTICING my neediness lately! This might sound silly, but I believe that revelation becomes part of us when we practice it. Let me give you a few practical everyday life examples. Grocery shopping: Normally, I try to carry two armfuls of groceries, attempt to tug the door handle and finagle the door open with my foot. Yeah… Okay this is revolutionary guys, lately, I have been… ASKING FOR HELP! This causes me to reject the lie that I should be able to do it on my own or that I am a burden to others. Um, not true!! Might sound silly but I invited my Mom into an opportunity to care for me in the moment I asked for her help. It was life giving for both of us, and we put away the groceries together as we chatted about life. Connection. AND, BONUS, this situation reminded me that God loves to meet my needs in practical ways, that He sees me, and that He loves to be involved in my little moments. One more! Recently, I got a concussion. I asked for help verrrrrry often as I recovered, but this is one of my favorite memories within that time - and potentially in all of my relationship with my mom. I couldn’t read for about a week and a half, so I asked my mom to read the Bible out loud to me. IT. WAS. INCREDIBLE. It brought back memories of her reading to me as a little girl and reminded me of everything important. I felt so connected to my mom in those needy moments. We would have never shared this experience, though, if I didn’t acknowledge my need, take a risk, and ask for help. Through this, God reminded me that He is present, He is engaged, and He loves to spend time with me. There are so many simple needs (or even desires) we have that we often disqualify before ever making them known. But how much more connection would we experience if we started asking for help from the people we trust a little more? - Asking for help unpacking the groceries. Asking someone to explain something you know nothing about but feel like you should know more. Letting someone know that you’re not feeling well and need to leave the party early. Calling up a friend when you feel lonely. Asking for prayer for something you feel like you shouldn’t be struggling with. Asking if your roommate can turn out the lights when you want to fall asleep. Everyday life, people. It’s small and spectacular. how much more connection would we experience if we started asking for help? Just as our neediness for God creates moments of intimacy, our neediness for people is an invitation into intimacy among family and community. Neediness opens the door to love and connection. Really, the whole adventure of life is about growing in LOVE. This is true maturity, not merely doing things right more often. Doesn’t that just lift the pressure of performance? The Father expands our capacity to love ourselves well by recognizing our needs are valid and were given to us as gifts from a kind Father. He expands our capacity to love ourselves and let others love us well by teaching us that some needs were given to us to be met by HUMAN BEINGS! WOAH!!! AND! He is expands our capacity to love others, as we become eager to meet others’ needs within community with the Helper. See how this creates family? Beautiful. I hope with all my heart that my story resonates with a piece of the one inside of you, and that you continue to grow in deep connection with the Father and the people in your life as you embrace your neediness.